Why do we make nature? What kind of nature do we make and do we really need it? Does nature from the twentieth century still fit into twenty-first century society? If we read into these questions, we can relate many developments in society to them: the increase in recreation and mobility, the degree to which urban-planning influences the use of space, the changing composition of the Dutch population (immigration, ageing), the evolving morals, the demand for the boundaries of the creation of our surroundings and the contemporary notion about the social, economical and intrinsic worth of nature. In 1996 en 2009 the Rietveld Academie and the Amsterdamse Bos have also worked together and organised special exhibitions in the forest. The Amsterdamse Bos gladly works together with the Rietveld Academie with the conviction that art projects and ideas that originate from this cooperation can be of great value for the future and development of the Amsterdamse Bos. That is why the Amsterdamse Bos and the Lecoraat Art & Public Space of the Gerrit Rietveld Academie are organizing a workshop and an exhibition in which these important issues and questions are central. 12 days in the Amsterdamse Bos, working on a proposition for an art project in the forest. Sleep in tents and work in a wooden hut, an underground nuclear bunker, a sea container and in the open air. Lectures, visiting lecturers, consultations and film screenings. On Friday the 27th of April you will present your plan. A jury will judge the plans and make a selection directly after the 12-day-workshop based on the quality of the project and the possibilities of production. In September and October the exhibition will take place in the Amsterdamse Bos. Students from Graphic Design shall design a publication in which all the plans will be given attention. Send your personal contact information and a letter of motivation with a maximum of 300 words before 1 March 2012 to Sietske Roorda: sroorda@grac.nl. From the application a maximum of 20 students shall be selected for participation. The 20 selected students shall be invited for an information session. Rietveld and Sandberg students from all departments can apply for the workshop. 12 days lodging, including breakfast, lunch and dinner: 35 euro. In the middle of the 1930s the unemployed were set to work to construct the Amsterdamse Bos. Now it smells of barbecues and biological goats. You hear the singing of nightingales, the rustle of the A9, the croaking of frogs and the roar of airplanes. In the nineteenth century the last Dutch primeval forest was cut down for the upcoming industry. Parallel to the increasing industrialisation, urbanization and pollution a love for nature occurred. Also the notion developed that free time was a right. Recreation, fresh air and sport were no longer the privileges of the wealthy, but were seen as a vital sustenance, necessary to maintain strength. Gradually recreation became customary. Nature transformed into recreational territory. For three-quarter century the Amsterdamse Bos offers space to picnicking families, nudists, rowers, bird watchers, cruising gays, dog walkers and tree huggers. The ideal of the healthy, relaxed worker seems to be realised. Or has the ideal been caught up with? 16,5 million people now live in the Netherlands, mostly in an urban environment. And the population will keep on growing until 2040. The more people, the more recreationists. But the physical space isn’t growing accordingly. And although the virtual domain –from Facebook to games- offers endless bites to reside in mentally, there is no oxygen. Where do the Dutch meet, or where can they escape each other? The Dutch nature has always changed along with the needs of society. 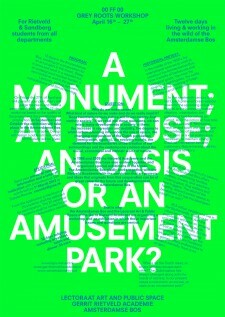 Is our present nature a monument, an excuse, an oasis or an amusement park?